You've accepted the invitation. Are you ready to take the next step? 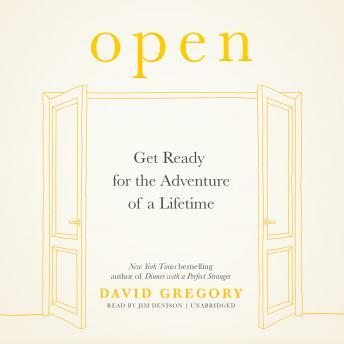 From the New York Times bestselling author of Dinner with a Perfect Stranger, Open will forever change the way you think about faith. It wasn't the end of the world. It was just the end of Emma Jameson's world. Fresh off the heels of a devastating breakup and floundering in her career, Emma is struggling to come to grips with why God allows so much pain in our lives, why he seems so absent when she needs him most, and why the Gospel accounts-our supposed guide for how to lead a contented Christian life-feel so completely irrelevant. Then one day a mysterious envelope arrives in Emma's mailbox with the word open written on the outside. Inside the envelope is a card bearing the following message: "For a real adventure with Jesus, go through the nearest open door." Skeptical, but having absolutely nothing to lose, Emma steps through the pantry door, only to find herself instantly transported back to the first century, where she is taken on a personal tour of various Gospel accounts by none other than Jesus himself-an experience that radically challenges Emma's perception of the Gospels and what it really means to be a Christian.